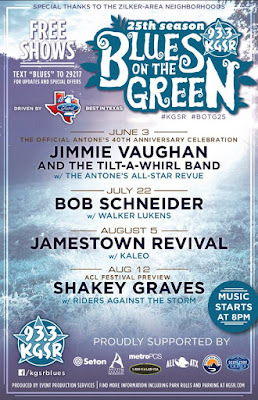 Blues on the Green is the biggest outdoor music event of the summer. If you haven't been before, the stage is set up on the northeast corner of Zilker Park, near Lou Neff Point. Music starts at 8pm and the concert is FREE. You can bring water, blankets, lawn chairs and dogs on leashes. Glass, alcohol, weapons and Styrofoam are not permitted. If you don't feel like bringing a picnic, you can buy food and drinks on site from vendors (just keep in mind you'll have to wait in line and need to bring cash). Head to the Springs beforehand. August is H-O-T in Austin, and although it cools down when the sun goes down, it's a very Austin twofer to cool down in Barton Springs before you head over to Zilker for the show. Don't forget to bring cash to enter the pool. The chilly but refreshing 69 degree water will make you forget about any traffic you encountered along the way. 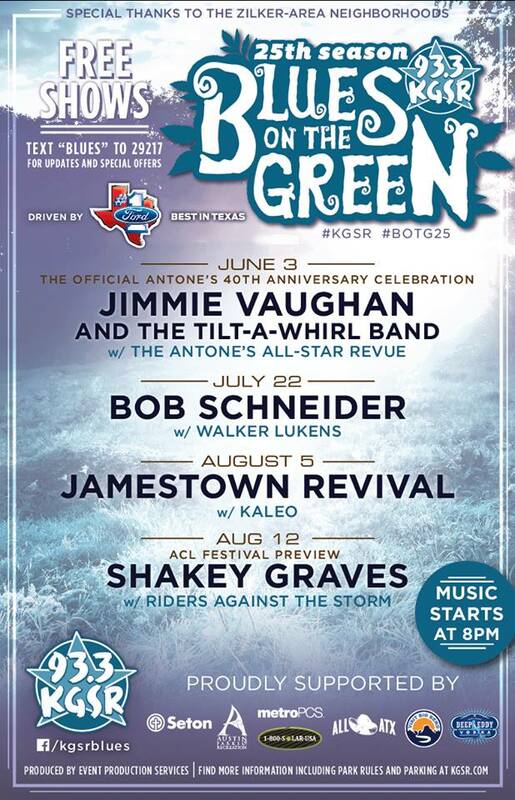 You can just wear your bathing suit and coverup over to Zilker and you will stay cool the entire BOTG show. Just remember to use the facilities before you leave, so you can avoid having to use the portable toilets at Zilker. Go early. Just as with any other large event in Austin, you'll want to go early to minimize traffic and crowd-related angst. If you take my advice and head to Barton Springs ahead of time, you can park near the pool for $5. Leave your cooler/picnic basket in your car, since no food is allowed inside Barton Springs. Plan to arrive at the Springs around 5pm for a closer-in spot. Although signs on Mopac direct you to exit on 1st Street, take the Rollingwood/2244 exit and park on the west side of the park (if you choose the 1st street option, you are directed towards the Stratford fields close to the Nature Center, which makes for a lot more walking). You'll want to arrive at Zilker a little early so you can get a spot as close to the stage as you can. The further back you are, of course, it's harder to hear the music. There are plenty of people who come and chat through the show, so you'll want to make sure you are close enough to be able to hear (you can always bring ear protection for the littles, although unless you are right next to the stage, you aren't likely to need it). Bring your own food and drinks. One of the nice things about Blues on the Green is that it's free, even if you consider the $5 parking charge. You can find some basics at the snack bar outside of Barton Springs, although when we began walking over to Zilker, they were shutting down and only had drinks and popcorn available. There are vendors at Zilker, but it's not a huge variety, lines can be long, you need cash, and of course, getting separated from your blanket/spot can present its own challenges. Alcohol is not allowed at Zilker, and none is available for purchase, although you can purchase a VIP ticket, which gets you food, two free drink tickets, parking, bathrooms and a cash bar. Many of the folks around us had brought in beer and wine in non-glass containers and the park police did perform random checks of some coolers and bags. We did brave the lines for Amy's Ice Creams, which was a nice treat for the kids. Ice cream is $4 for a limited selection of the most popular flavors, and toppings are a dollar extra. Enjoy the show. Let's be honest - from dealing with parking to driving to getting the kids fed to finding a spot to keeping them up past their bedtimes, Blues on the Green does present some logistical challenges. So once you are there, sit back and enjoy the show. You'll enjoy the cooler temperatures, the festive atmosphere, the feeling of accomplishment that you made it -- not to mention a free show from some great bands. 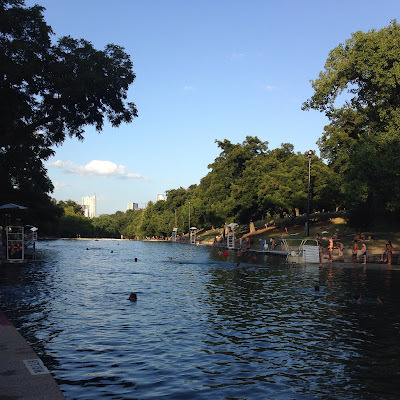 Soak it all in and have yourself a very Austin summer experience! About the author: A recovering workaholic, Nicole Basham now spends her time rediscovering Austin through her 9-year-old son's eyes. A soccer-playing mom, Nicole also enjoys tickling too close to bedtime, taking in some live music and being silly. You can also find her writing at LiveMom.com.